Hey Friends ! this is Shahin Alam. Welcome to my new trick How To Save Your Personal App/Data From Others. 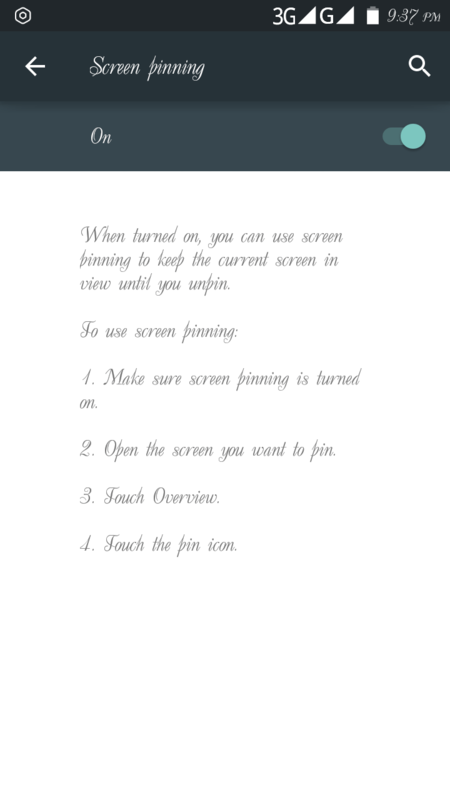 The feature name is Screen penning. If you have some friends whose are very bad then this feature is for you. It will help you to save your personal data or apps. Suppose, one of your friend want your phone for a call only. But who knows he has any plan to check your data. Now what can you do ? Of course you will give him the phone without any doubt. But your data ? Surely he will check them all. If you want to get rid of this situation this trick will help you so much. When a friend want your phone, you ask him what the necessary. After that you can lock the phone in that app. So, he never get out from the app till you want. As a result your files will be saved. Are you thinking this is a really good trick ? Then you are welcome to it. So friends what are you waiting for ? I am giving your trick bellow. 3. Go to Screen Pinning. Now friends its to use. If you want to Stop it then follow the structure. 1. Just hold on your back button and window button. Now you can enjoy the trick at anywhere or any time to anyone. And your data will be safe. Friends ! if you like my trick then please comment. Stay with me to get more new and awesome trick about smart devices. Till then be well. Bye.